Notes from the designer: "This style of jacket became popular when Nehru ruled India after World War II. It is as popular today as when it was first introduced. 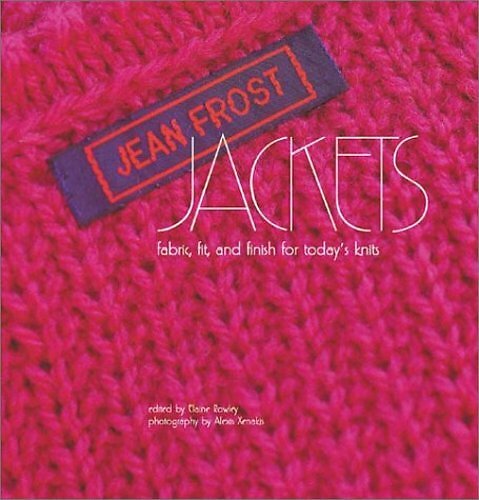 The jacket's lines lend themselves to simple knitting. The garment is slightly fitted and has a narrow stand-up collar. I used reverse stockinette stitch to display the beauty of a textured yarn." Three sizes are offered ranging from 41.5 inches (105.4cm) to 46 inches (116.8cm). A schematic shows shaping and other key measurements. Standard ease: Up to four inches (10cm). There is a crocheted edging and seams are joined with a crocheted slip stitch. A US F/4mm crochet hook is needed. The sweater is knit flat with separate pieces for the 2 fronts, back and sleeves. Neckline stitches are picked up and knit to make the collar. Button holes are knit into the body of the sweater. There is no button band. You will need 7 3/4 inch (2cm) buttons for the small size and eight for the two larger sizes. The pattern does not specify a yarn, just the bulky weight. The illustrated sweater in the book is knit from Wool in the Woods Pizazz. The Knit Picks version uses their Twirl. Difficulty level is rated Intermediate.